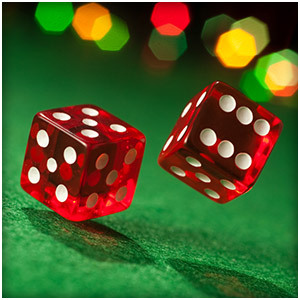 The most basic type of bet in craps is called a Pass Line bet. The Pass Line is the curving part of the betting area, which is near where players stand. When you make a Pass Line bet, you are betting with the dice, while a Don’t Pass bet means you are betting against the dice. Here’s how it works. When a person starts shooting, their first roll is called a come-out roll. If you make a Pass Line bet, you are betting that their first roll will be 7 or 11. If that is the roll, then you double your money. If they shoot Craps (meaning they throw a 2, 3 or 12), then you lose. If they roll any other number, then that sets the Point. Now you need them to roll that same number again before they roll a seven. If they do, then you double your money. If they roll a 7 before the point, then you lose. This is just the opposite of a Pass Line bet. With one exception, whenever a Pass Line bet wins, a Don’t Pass bet loses, and vice versa. For the come out roll, if they throw a 7 or 11 you lose. If they throw a 2 or a 3, then you double your money. When the shooter throws a 12 on the come out roll, this is the exception. Even though Pass Line bets lose, Don’t Pass bets get a push instead of a win. On subsequent rolls, if they roll the point number before a 7, you lose, but if they roll a 7 first, you win. Now the question is: which of the two craps bets is the best? The answer – both. You just have to know the game and really understand the rules. As a player, you are at liberty to choose. Do you feel lucky right now?